Darren J. Baker, Ph.D., M.S. explains what zombie cells are. Darren J. Baker, Ph.D., M.S. shares why we should care about zombie cells. Darren J. Baker, Ph.D., M.S. discusses the possibility of preventing dementia. On Tuesday, October 30, 2018, Sandhya Pruthi, M.D., associate medical director for the Department of Development, joined the Mayo Clinic Leadership Council for a conversation with Darren Baker, Ph.D., M.S., a Mayo Clinic molecular biologist working to understand zombie cells and how to eliminate them. Spread the news. 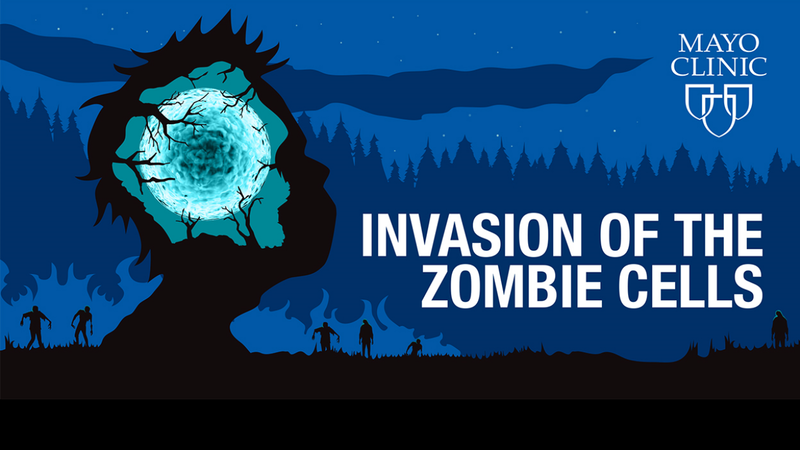 Share the zombie cell story with your family, friends and colleagues, especially those who are interested in the latest breakthroughs in neurology, cardiovascular health, arthritis, and aging. Champion the Mayo Model of Research. Research is critical to advancing the practice of medicine. Mayo’s world-class scientists and physician-researchers collaborate in a continuous cycle that may begin with an individual’s medical need and lead, through basic and clinical research, to medical innovations that transform lives. Share your passion. As a not-for-profit institution, Mayo Clinic couldn’t advance medicine as rapidly as we do without the generosity of benefactors. Let others know why you choose to support Mayo and invite them to join you in inspiring optimism in people who need it most.